Sweet guido tat. o wait. this kid looks like he has dirt all over his face or the artist totally messed up the shading colors! 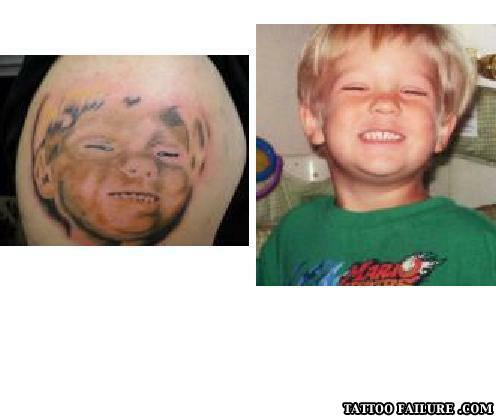 The kid tattoo sorta looks like a burn victim. I was going to say i hope this guy didnt pay money for that tatt. But either way he will be paying for it for the rest of his life. Learn a lesson here people if you ever want any kind of a tatto and you dont want to end up like any of these poor people. make sure you pick your tattoo artist wisely. And make sure you see there skills by other finished tatts they have done. (make sure it's there own work). Turned him into a freakin zombie! Is this what his zombie son looks like? easy ... anakin, episode 1 ... but who is that boy on the photo? sweet child but why there is a muddy pig on the left? You get it half prise if i can be drunk" " Wow what a deal! A: We're eating you for breakfast today. B: Thank you, I'll have my arm.